Oh, what a tangled web the unindicted co-conspirators in the Deep State coup to keep Hillary Clinton out of prison and Donald Trump out of the White House have woven. When you tell the truth, the adage goes, you never have to remember anything. But when you lie, you have to remember the lies you told to cover the earlier lies, and you certainly have to keep your story in line with your other co-conspirators. McCabe commented on leaking information to a former Wall Street Journal reporter about the investigation of Hillary Clinton and the Clinton Foundation, saying he was authorized to “share” the information and did so with the knowledge of “the director,” which would have been Comey at the time. Comey, who was fired by Trump in May, was open about at least one leak in testimony last Thursday. He admitted to using an ex-U.S. attorney, later identified as Columbia University Prof. Daniel Richman, to leak to The Times the contents of alleged memos Comey wrote about his one-on-one interactions with Trump. He was not asked if he had ever used Richman on other occasions; however, Richman is mentioned in 151 results in a New York Times search dating back to 1993, with 11 of those articles also featuring Comey and six of them being authored by Michael S. Schmidt – who later wrote the “Comey memos” story which Comey told Congress he directed Richman to leak. A four-page House Intelligence Committee memo alleging abuse of surveillance authority raises immediate questions about former FBI Director James Comey’s role in utilizing the infamous, largely discredited 35-page anti-Trump dossier to obtain a FISA court warrant to monitor an individual associated with Donald Trump’s 2016 presidential campaign. One glaring possible inconsistency centers on Comey’s June 8, 2017 prepared remarks for the Senate Select Committee on Intelligence, where he referred to the anti-Trump dossier as containing “salacious and unverified” material. Yet, according to the memo crafted by House Republicans, Comey personally signed three FISA court applications utilizing that same dossier that he labeled “salacious and unverified” eight months later to obtain FISA court warrants to conduct surveillance on Carter Page, who briefly served as a volunteer foreign policy adviser to Trump’s 2016 campaign. The memo documents that on October 21, 2016, the FBI and Justice Department sought and received the FISA order against Page, and that the agencies sought the renewal of the order every 90 days in accordance with court requirements. Renewals require separate finding of probable cause each time, the memo relates. According to the memo, Comey “signed three FISA applications in question on behalf of the FBI, and Deputy Director Andrew McCabe signed one.” Sally Yates, then-Acting Deputy Attorney General Dana Boente, and Deputy Attorney General Rod Rosenstein signed one or more of the applications on behalf of the Justice Department. 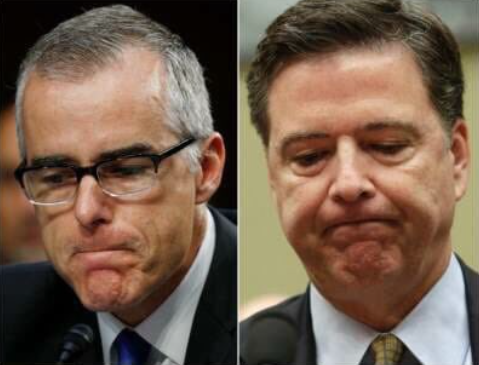 McCabe, Strzok, and Comey, of course, were all connected to the editing of Comey’s pre-exonerating Alice-in-Wonderland memo – verdict first, investigation later. Sen. Ron Johnson, R-Wis., chairman of the Homeland Security Committee, in a letter to current FBI director Christopher Wray, reveals how edits to Comey’s exoneration memo went beyond changing “grossly negligent” to “extremely careless” but edited out content that shows that the FBI knew that Hillary was intentionally in violation of the Espionage Act but that, since the decision to exonerate her had already been made, the FBI had to submit to the annals of history a lie already agreed upon. The letter reveals specific edits made by senior FBI agents when Deputy Director Andrew McCabe exchanged drafts of Comey’s statement with senior FBI officials, including Peter Strzok, Strzok’s direct supervisor, E.W. “Bill” Priestap, Jonathan Moffa, and an unnamed employee from the Office of General Counsel (identified by Newsweek as DOJ Deputy General Counsel Trisha Anderson) – in what was a coordinated conspiracy among top FBI brass to decriminalize Clinton’s conduct by changing legal terms and phrases, omitting key information, and minimizing the role of the Intelligence Community in the email investigation. Doing so virtually assured that then-candidate Hillary Clinton would not be prosecuted. Furthermore, the FBI edited Comey’s statement to downgrade the probability that Clinton’s server was hacked by hostile actors, changing their language from “reasonably likely” to “possible” – an edit which eliminated yet another justification for the phrase “Gross negligence.” To put it another way, “reasonably likely” means the probability of a hack due to Clinton’s negligence is above 50 percent, whereas the hack simply being “possible” is any probability above zero. McCabe’s response to his totally justified firing is the string that, if pulled upon, would unravel the entire criminal conspiracy to deny Donald Trump the White House. McCabe deserves the inevitable criminal indictment for his lies, and his revelation of yet another Comey lie seals his fate as well. Why should McCabe be denied his pension for his lies while serial liar Comey is allowed to cash in on a book and book tour? As for Comey, he appears to have stolen government documents, a crime under 18 USC 641. If any were classified (as Grassley seems to believe), it’s a crime under 18 USC 1924 (and probably 793). Deceiving the FISA court and concealing evidence? That’s 6 different felonies. James Comey perjured himself before Congress, before the FISA court, and before the American people. Indict McCabe, then Comey, then just go down the list. McCabe promised to take people down with him if he was fired. Time to make some popcorn. « Former Sen. Songstad & Gov. Sundquist plot to murder Lee Wanta recorded on tape!